The ground-breaking of a 140-million Euro-worth new cement plant in Sivas, Turkey by Votorantim Cimentos, the eighth largest cement producer in the world, shows once more the trust the company places on Turkish market. Operating in 14 countries in 5 continents, Votorantim Cimentos announced in May its decision to increase its capacity in Turkey through its investment to be made in Sivas plant. The ground was broken on the new plant on August 26th, Wednesday during a ceremony attended by the Brazilian and Turkish Directors of the Company as well as leading figures of Sivas. The ground-breaking ceremony of the 140 million Euro-worth new cement plant in Sivas, the largest ever private sector investment made in Sivas, was attended by members of the Board of Directors as well as Votorantim Cimentos CEO, Walter Dissinger, President of Europe, Asia and Africa region, Erik Madsen, Turkey CEO of Votorantim M. Şefik Tüzün and senior managers of the companies of Brazil and Spain. 140 million Euro-worth cement plant in Sivas will be the largest investment not only for Sivas but also for Votorantim Cimentos outside the American continent. Votorantim Cimentos CEO Walter Dissinger – "This investment demonstrates our confidence in the Turkish market potential and reinforces our commitment to the region in the long term, especially Black Sea and Anatolia." Following the ceremony, the directors visited the existing plant and the construction site of the new plant and received detail information on the investment in Sivas. Sivas Cement Plant will bring up the annual production capacity of the plant from 0.6 million tons to 1.8 million tons, amounting to a three-fold increase. Making the full use of its production capacity in Turkey, Votorantim Cimentos will boost its market position after Sivas investment. 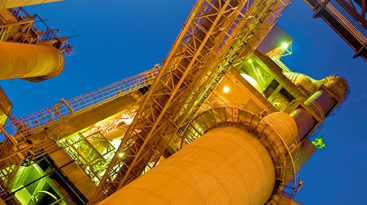 Sivas plant, currently holding a 19% share of the total 3 million ton cement production capacity of Votorantim Cimentos in Turkey, will have as high as 42% share after the new investment. Votorantim Türkiye CEO, M. Şefik Tüzün explained that "The plant will create employment for 700 people, only during the construction phase, and start cement production in 2017".